Rooms: Fee includes motel rooms in Connell, Kellogg, and Whitefish. Two riders per bed, rooms are double queens and suites. Entry Fee: $175, cost recovery. There is a cancellation fee if you cancel after June 1 and there is no one to take your place. See the application for more info. Oregon Randonneurs membership required. Support: We will transport a duffle bag between overnight hotels. If your duffle is heavy, you will be responsible for loading and unloading it each day. You will not have access to your duffle during the day. Riders should be prepared to be self-sufficient during the day. Services are available during the daylight hours. Services are very limited during the night. If you choose to ride through overnight controls, you will be completely on your own. If you abandon, you will be responsible for getting yourself to wherever you need to go. Most likely this will be hitch-hiking to a city big enough to have a bus station. Also, note that cell service is extremely limited along the entire route. If you need to contact the ride organizer, you will probably be leaving a message at the overnight control. This is our first 1000k event and we expect it to be a good one. This is a point to point route starting in Troutdale, OR and finishing in Whitefish, MT just outside Glacier National Park. The brevet start, Troutdale is easily accessable via public transport.There are several motels along Frontage Rd including a Motel 6, and Holiday Inn Express. The area is a major truck stop for I-84. Most rooms at McMenamin's Edgefield are booked for that weekend but hostel beds are available. We plan to start from Edgefield lower parking lot. Check with Edgefield if you want to leave your vehicle parked there. This may not be allowed as the parking lots are usually full on weekends. It is strongly suggested that you not leave a vehicle in Troutdale, but instead make your way to the start via riding, public transportation or have someone drop you off the night before or early morning. The brevet finishes in Whitefish, MT and you have a bed there when you finish. Amtrak (about 6 blks from the motel) leaves for Portland and Seattle each evening. If you use Amtrak, you will need to pack your bicycle in a bike box (they have 100 boxes in stock for purchase). We will have tools for removing pedals and turning handlebars. We will not transport bike cases. We have overnight control stops in Connell, WA (400k), Kellogg, ID (700k) and Whitefish, MT (1000k). It is strongly recommended that you not ride through the overnight stops if you intend to sleep. The next town with a motel past Connell is Colfax (530k). Wallace is a short distance past Kellogg, but then there is a stretch of over 70 miles with absolutely no services of any kind until Thompson Falls, (including passing motorist.) Two different locals have also informed us that this part of Idaho is where the "Bad Bears" for Yellowstone are brought. "Bad Bears" are those that are not afraid of humans and so approach them for food. Riders riding beyond the overnight stops will have no organizer-supplied support of any kind. You may of course, bring your own support and they can meet you at controls. Controls are generally spaced 100-150k apart. Day 1 (400k) - Columbia River Scenic Hwy, Crown Point, Waterfalls including Multnomah, Bridge of the Gods, you are along the Columbia River as far as Plymouth, WA. Climb up over the big bump via Clodfelter and down to Kennewick/Pasco. Leaving Pasco, last stop light until Kalispell, MT near the finish. North out of Pasco via Glade Rd. Those familar with Cascade 1200 in Eastern Washington will feel at home. Overnight in Connell. Early arrivals can eat at the restaurant on site. There is a 24Hr Sunmart 1 blk from the hotel. We'll have some food so you don't go hungry but this will likely be sandwiches, drinks and such. Statistics say you will have a tailwind. If it is an off day and you have a east wind it will be very hot, dry and you may be wondering what the organizer had in mind.Controls: Troutdale, Lyle, Roosevelt, Kennewick and Connell (overnight). 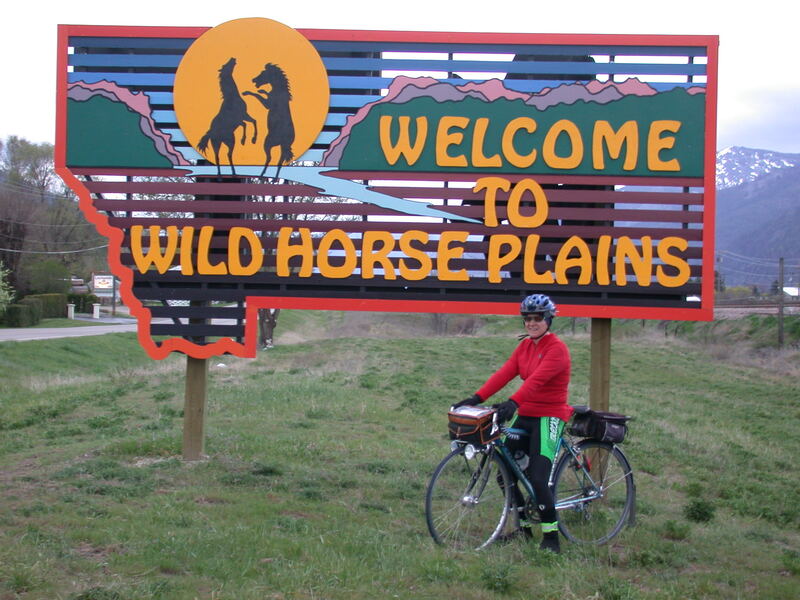 Day 2 (300k) - Washtucna Coolee, the rolling Palouse, 53 miles of the Coeur D Alene bike trail. The scenery changes several times during the day. Towns are small and services limited but available during daylight hours. 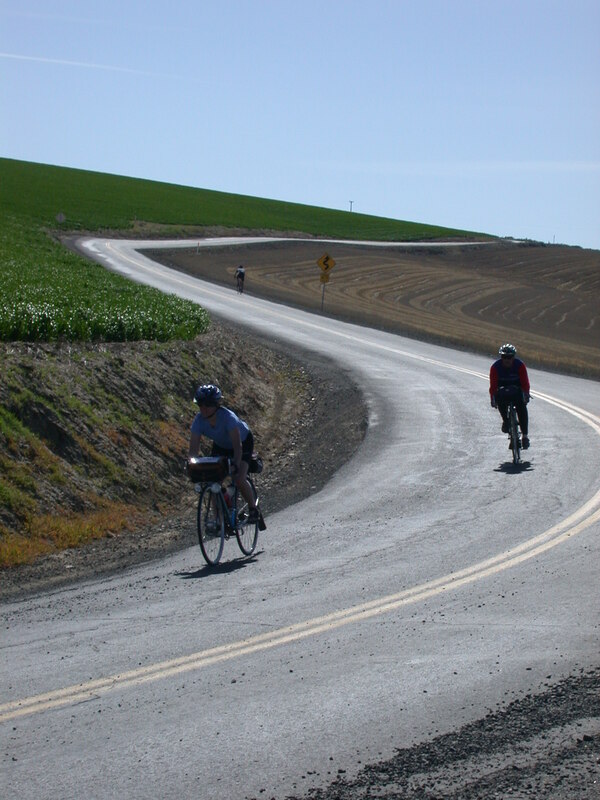 Loved the rolling, curvy, green hills and roads of the Palouse. Before you get started on the CDA trail be sure to stock up with food and water in Plummer. The trail is truly remote from roads and you'll be on it for 53 miles, most likely during night hours. Since they don't have foglines on paved trails, good lights are essential. But no need to worry about the nightime drivers. This trail, opened in 2004, is smooth, flat and no where near vehicular traffic until you near Kellogg. The overnight is in Kellogg. You roll off the trail into bed, almost. They have a great breakfast included with the room and will set up early for us (4AM). The rooms are exceptional so take advantage of them as the last day is the hardest Controls: LaCrosse (Info), near Colfax (Info), Colfax, Plummer, Kellogg (overnight). Day 3 (300k) - Dobson Pass, Thompson Pass, North Fork River, a high wide valley (strong crosswinds), big rollers along Flathead Lake. The climbing starts 2 miles out of Wallace and continues for 4 miles. It is steepest near the top. The downhill is rough, curvey and steep. Thompson Pass is more gradual, but again steep near the top. Both passes are just under 5000 elevation. It is gradual downhill along the North Fork river, scenery is wonderful. After leaving Plains, climb for 5 miles to a plateau. There were generally strong crosswinds in this high wide valley. Be sure to stop in Lone Pine Grocery to stock up on water and food (including Idaho Spuds candy bars). At mp 44 it is downhill to Flathead Lake. Lots of big rollers along the lake. Not much in the way of services. If nothing is open in Lakeside, stop at the restrooms on the right to fill up on water. Next stop Kalispell. We skirt through town on residential streets with lots of stop signs. Anything you need can be found on neighbooring US-93 or US-2. The route finishes traveling Whitefish Stageline Rd which parallels US-93 to Whitefish. Controls: near Pickard (Info), Plains, Whitefish (finish & overnight).